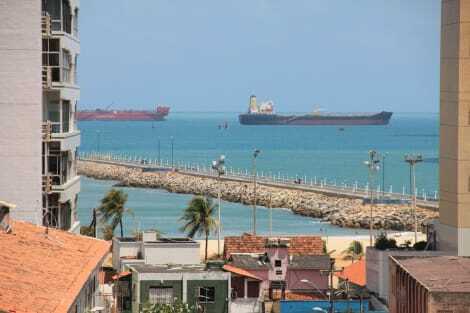 Located in Fortaleza (Praia do Futuro), Fortaleza Park Hotel is close to Sabiaguaba Beach and Ceara Convention Center. This beach hotel is within the vicinity of University of Fortaleza and Cofeco Beach.Rooms Make yourself at home in one of the 69 guestrooms featuring minibars. Conveniences include safes, and both irons/ironing boards and cribs/infant beds (complimentary) are available on request. Pamper yourself with onsite massages or enjoy recreation amenities such as an outdoor pool. Additional features include complimentary wireless Internet access and a television in the lobby.Dining Enjoy a satisfying meal at a restaurant serving guests of Fortaleza Park Hotel. While enjoying a refreshing dip in the hotel pool, you can order your favorite drink at the poolside bar. A complimentary breakfast is included.Business, Other Amenities Self parking (subject to charges) is available onsite. Make yourself comfortable in your air-conditioned apartment, which features a minibar. Complimentary wireless Internet access keeps you connected, and cable programming is available for your entertainment. The bathroom has a shower and complimentary toiletries. Conveniences include a desk and a separate sitting area, and housekeeping is provided daily. Make yourself comfortable in this air-conditioned apartment, featuring a kitchen with a refrigerator and a stovetop. Complimentary wired and wireless Internet access keeps you connected, and a 24-inch LED television is provided for your entertainment. Conveniences include a desk and a microwave, and housekeeping is provided on request. With a stay at Sambura Praia Hotel in Fortaleza (Mucuripe), you'll be steps from Beira Mar and 5 minutes by foot from Meireles Beach. This family-friendly hotel is 1.5 mi (2.4 km) from Iracema Beach and 1.7 mi (2.7 km) from Praia do Futuro. lastminute.com has a fantastic range of hotels in Fortaleza, with everything from cheap hotels to luxurious five star accommodation available. We like to live up to our last minute name so remember you can book any one of our excellent Fortaleza hotels up until midnight and stay the same night.